At 14,763 square kilometres in size, the Serengeti is arguably the finest national park in Africa and offers a wealth of wildlife viewing opportunities. Pretty much every large animal in East Africa can be regularly seen in the national park or wider ecosystem. When you include all the contiguous protected areas, of which Ngorongoro is one of the most noteworthy, the total size of the entire Serengeti-Mara ecosystem is a staggering 30,000 square kilometres packed choc-full of truly extraordinary wildlife sightings. Renowned for its predators – especially lions, leopards and cheetahs – and with plenty of elephants favouring the western woodlands of Grumeti, the Serengeti dazzles even the most hardened safari critics. There is even a recovering black rhino population concentrated around Moru Kopjes giving visitors a realistic chance to sighting all of the Big Five (lion, elephant, rhino, leopard and buffalo), although the critically endangered black rhinos will undoubtedly prove the greatest challenge. The Serengeti ecosystem is also a renowned bird-watching destination, with over 500 species recorded to date. Exploring the unique Ngorongoro Crater – surrounded by the towering volcanic walls on every side and blessed with prolific and extremely well-habituated wildlife – almost feels like you’re driving through a zoo; only the surrounding crater scenery is jaw-droppingly impressive. 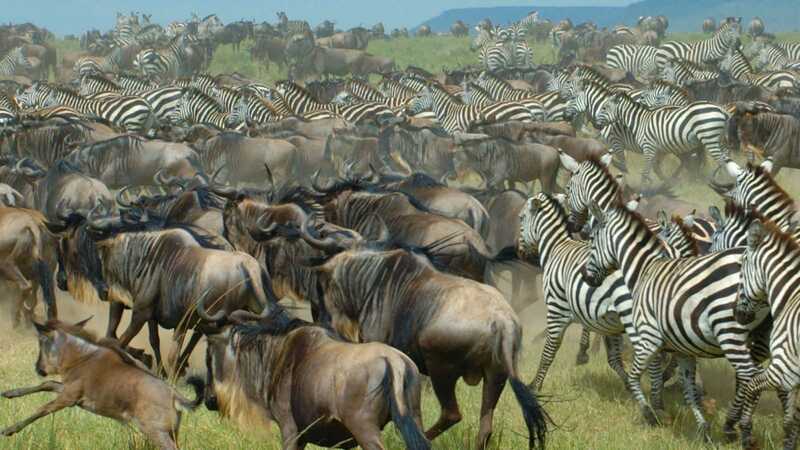 With the greater Serengeti ecosystem so blessed with wildlife and scenic beauty, it is hard to imagine it could have anything more to offer, but the great East African migration steals the show. The migration is quite unique in that it is a perpetual phenomenon without beginning or end. It is universally regarded as one of the greatest wildlife spectacles on earth. The sound alone is deafeningly impressive. 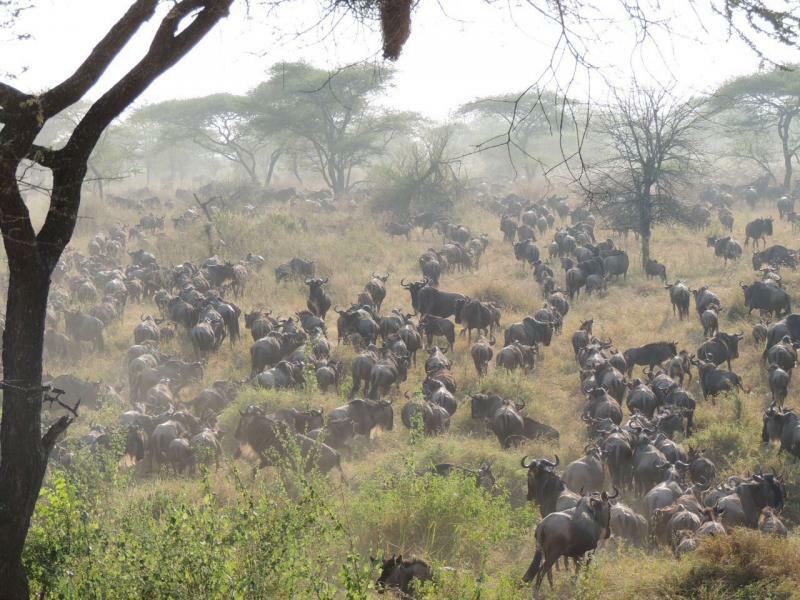 It is, however, often very difficult to appreciate the scope and sheer size of the migration because, without a bird’s eye view of proceedings, it is difficult to comprehend the sprawling scale of the wildebeest numbers. A sunrise hot air balloon ride is the ideal way to appreciate the huge herds and long columns of plodding animals. Standing atop a rocky kopje is another recommended way to gain some perspective to better appreciate the sheer number of animals involved. While most safari goers target the June-July period for the western corridor and Grumeti River crossings, as well as the July-October period for Lamai and the Mara River crossings, there is a strong argument for waiting for the less popular rainy season months to view the wildebeest in the southern plains when they give birth to half a million calves over a three week period – usually in February.